Hotel Floyd presents the "Music in the Mountains" 2018 Concert Series Finale with Dylan Underwood on Thursday, October 18, 2018. Dylan Underwood plays rock and Americana. Each Thursday, May - October, you'll find a free concert in the Hotel Floyd Amphitheater or the Warren G. Lineberry Park (next to the Dogtown Roadhouse) and some barbecue or other tasty treats close by. It's a great time to kick off your shoes or grab a rocking chair for some foot-tappin' and a little rockin' goodness. 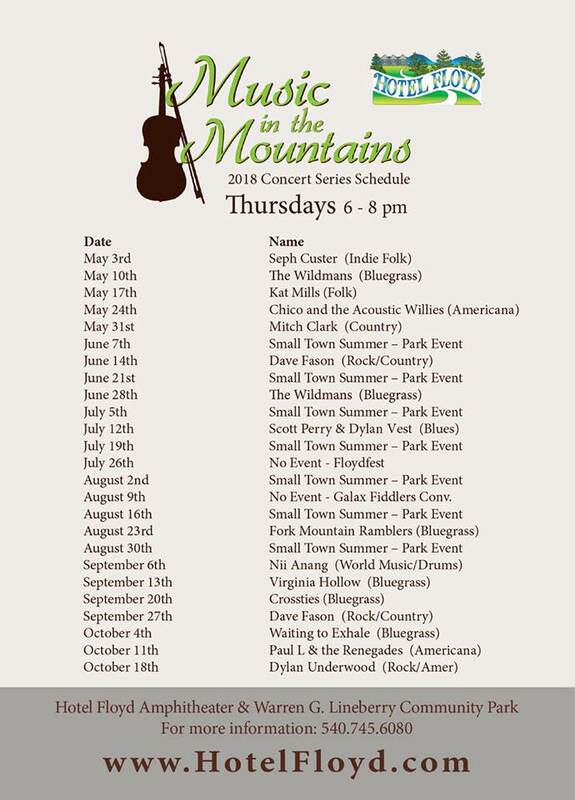 To view the Music in the Mountains concert series flyer, visit: https://i.imgur.com/ouFwjT3.jpg. For more information, visit: https://www.hotelfloyd.com/music-in-the-mountains.html or https://www.facebook.com/hotelfloyd or call 540-745-6080.